Get the signs you need in one convenient PDF pack! There are ten posters in this pack that have the most commonly needed signs for you and your little one! 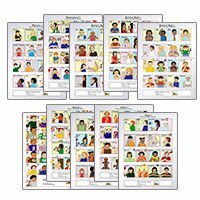 Learn to sign using these custom illustrated, detailed charts from Babies and Sign Language! Each sign is shown signed using ASL signs. Each sign is shown using anatomically correct hands.